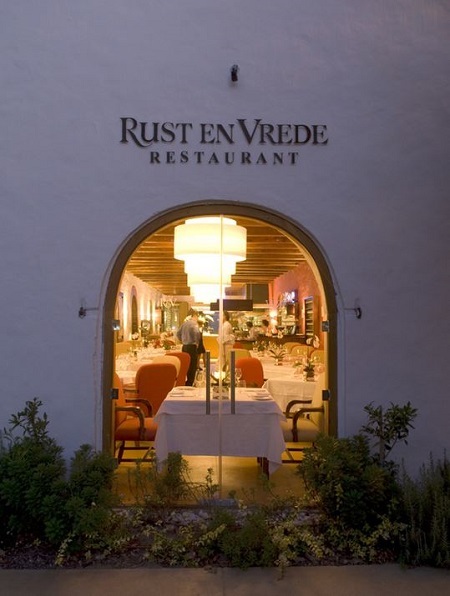 It’s not about the estate’s wine, but a new piece on Forbes.com about the Rust en Vrede Restaurant says very much, indeed, about the quality vision of proprietor Jean Engelbrecht. In Engelbrecht’s vision, excellent wines should fit like interlocking puzzle pieces with food, and they should be enjoyed in a sparkling yet relaxed setting. A dinner at the then-new French Laundry in Napa Valley in the late 1990s showed him how a great menu and a great wine list complement each other. “Ever since that day I wanted to do something similar at Rust en Vrede,” Engelbrecht has said, and in 2007 the winery opened Rust en Vrede Restaurant, housed in the old winery building that was built in 1782. Here, you can walk up to Chef John Shuttleworth in the kitchen and ask him a question. We literally did this, twice, first because we were curious how he sliced the potatoes for his New Potato “Risotto.” (The short answer: knife skills, in spades.) Then, much later, we went back to ask about the chocolate fondant that was served for dessert. Here, in this casual world-class restaurant, you felt at ease. You were in for a treat and you knew it, but all the messaging to that effect was toned down. It was confident, but not showy. More steak, less sizzle. You can read the full piece by Huyghe online on Forbes.com.